Summary: Project Astoria delivers a set of patterns as well as a concrete infrastructure for creating and consuming data services using Web technologies. This article explores how modern data-centric Web applications and services are changing and the role Astoria can play in their new architectures. While the software infrastructure provided by Astoria can be a useful piece of the puzzle when building new Web applications and services, it is just one piece. Other elements in these applications need to be organized in a way that enables interaction with data across the Web. In this article, I will discuss the architectural aspects that are impacted by modern approaches for Web-enabled application development, focusing on how data services integrate into the picture. The new generation of Web applications utilizes technologies such as AJAX, Microsoft Silverlight, or other rich-presentation infrastructures. One common characteristic of all these technologies is that they impose a change with respect to the way Web applications are built. Figure 1 compares the flow of content in traditional and modern Web applications. Traditional data-driven Web applications typically consist of a set of server-side pages or scripts that run when a request arrives; during execution they execute a few queries against a database and then render HTML that contains both presentation information and data embedded in it. Interestingly, this new round of technologies is acting as a forcing function to push application organization toward a goal that is common in many application architectures: strict separation of data and presentation. Serving user-interface elements is relatively straightforward from the server perspective. Most of the time these are simple file resources on the server, such as HTML or CSS files, media files. Serving data is another story. Until now, interaction with data was something that happened between the Web server and the database server; there was no need to expose entry points accessible from code running across the Web in a Web browser or some other software agent. This is where Project Astoria kicks in. There are a number of ways to expose data to clients that will consume it from across the Web. One approach that is enabled by existing technologies is to use an approach similar to Remote Procedure Call (RPC), where “functions” are exposed through an interface such as Web services (for example, a SOAP-based interface or a simple URI-based convention for invoking methods and passing parameters). Microsoft Visual Studio has a mature set of tools that makes it straightforward to both create and consume interfaces built this way. The ASP.NET AJAX toolkit takes this to the next level by enabling Visual Studio-created Web services to work with AJAX clients. The main issue with this approach is flexibility. If interaction with data only happens through fixed, predefined entry points then every new scenario or every variation of existing ones with slightly different data will typically require the creation of new entry points. While this level of control is occasionally desired, in many cases, more flexibility would increase development productivity and contribute to a more dynamic application. Project Astoria introduces an alternative to the RPC approach that is based on the simple semantics of HTTP. Astoria takes a schema definition that describes each one of the entities that your application deals with, along with the associations between entities, and exposes them over an HTTP interface. Each entity is addressable with a Uniform Resource Identifier (URI) and a URI convention allows applications to traverse associations between entities, search entities, and perform other commonly needed operations on data. The schema definition used by Astoria is an Entity Data Model (EDM) schema, which is supported directly by the ADO.NET Entity Framework. The Entity Framework also includes a powerful mapping engine that allows developers to map the EDM schema to a relational database for actual storage. In order to show interaction with Astoria services, I will use an example based on the well-known Northwind sample database. A data service on top of Northwind can be set up by creating an ASP.NET application, importing the Northwind schema from the database into an EDM schema using the EDM wizard, and then creating an Astoria data service pointing to that EDM schema. Detailed steps for creating Astoria data services, as well as extensive documentation on the Astoria URI and payload formats, can be found in the “Using Microsoft Codename Astoria” document available on the Astoria Web site at http://astoria.mslivelabs.com. When a URI points to a specific resource such as the one just discussed, it is possible not only to retrieve the resource using an HTTP GET verb, but also to update it, using HTTP PUT, or delete it, using HTTP DELETE. Since the schema description provided to Astoria includes associations between entities, those can also be leveraged in the HTTP interface. 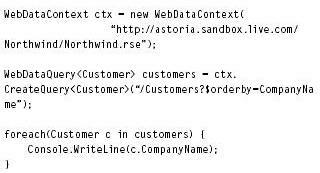 Continuing with the example, if each Customer resource is associated with a set of Sales Order resources, then the following URI represents the set of Sales Orders related to a particular Customer: http://astoria.sandbox.live.com/northwind/northwind.rse/Customers[ALFKI]/Orders. In addition to being able to point to specific resources and list resources in a container, it is also possible to filter, sort, and page over data to facilitate the creation of user interfaces on top of the data service. 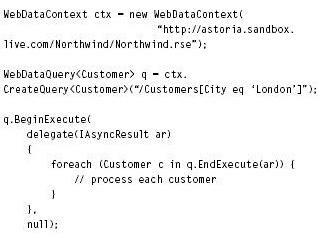 For example, to list all the Customer resources in the city of London, sorted by contact name, an application can use this URI: http://astoria.sandbox.live.com/northwind/northwind.rse/Customers[City eq ‘London’]?$orderby=ContactName. The actual format of Astoria URIs is still subject to change, but the semantics and capabilities should remain relatively stable. You can see that the response includes simple properties and hyperlinks to other resources (“Orders” in the example). Every resource also includes a URI that represents the canonical location for it (in the URI attribute of the Customer element above). There are a number of options for interacting with data sources from the presentation layer. The first aspect that will scope the available options for a given scenario is the nature of the client (for example, browser versus rich client). Since the Astoria interface is just plain HTTP, pretty much every environment with an HTTP client library can be used to consume data services. The interface has been specifically designed to be easy to use at the HTTP level; the URI patterns are simple and human-readable, and the payload formats use JSON or a subset of XML that keeps it straightforward. The Astoria client library runs both on the .NET Framework and inside Microsoft Silverlight. This enables the creation of desktop applications and Silverlight-based Web applications using the same API, just by referencing the corresponding Astoria assembly for the target environment. Astoria enables developers to simply point to a database or a prebuilt EDM schema and it will automatically generate an HTTP view of it. While this is great for the initial iterations of an application, this wide-open interface to the data will often not be appropriate for production applications. In most databases, there is a relatively clear split between two kinds of data (most typically, two kinds of tables): There is a part of the data that has enough implied semantics in itself; this is true for simpler concepts such as “product category.” In those cases, business logic is usually thin or inexistent, and the direct interface to the data is good enough. The other part of the data only makes sense with some business logic around it; for example, the data that is shown needs to be restricted based on the context, or modifications need to pass external validations, or when a given value is changed, another side-effect needs to take place, and so on. To address the requirement of being able to introduce business logic that is tightly bound to certain pieces of data, Astoria supports two customization mechanisms: service operations and interceptors. 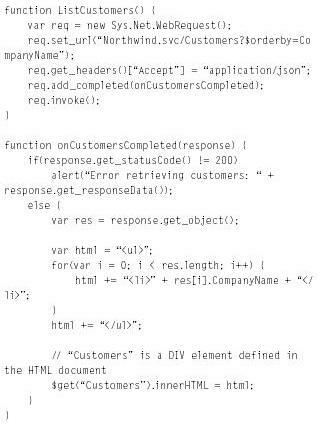 The service operation can also contain code to perform validations, log activity, or any other need. This provides a good middle-ground between strict RPC, which makes building flexible UIs hard, and wide-open data interfaces that do not allow for control of the data that is flowing through the system. For scenarios where preserving the resource-centric interface is desired, interceptors can be used. An interceptor is a method that is called whenever a certain action happens on a resource within a given resource container. For example, a developer could register an interceptor to be called whenever a change (POST/PUT/DELETE) is made to the “Products” resource container. The interceptor can perform validations, modify values, and even choose to abort the request. 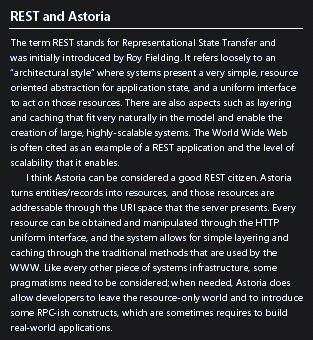 So far I have discussed Astoria in the context of EDM and the ADO.NET Entity Framework. When using Astoria for surfacing data in a database, this is most likely the best choice; however, not all data is in a database. In the first public CTP of Astoria, we have only targeted the Entity Framework. As we iterate on the design of the product, we are changing that to provide more options. Specifically, in order to enable scenarios where you want to expose data sources that are not databases, we will support using any LINQ-enabled data source to be exposed through the HTTP interface. With this extensibility point in place, developers will be able to bring a broad set of data sources into the picture and expose them through the HTTP interface. This ranges from access to specialized data stores to using LINQ-based access libraries for online services (for example, there are informal implementations of LINQ to Amazon and LINQ to Flickr that provide limited query capabilities to those Internet sites). A typical data-driven Web application today will have its own database in addition to one or more Web servers. For enterprise applications, these servers are part of the IT infrastructure and for applications hosted in ISPs, most ISPs provide database services. Along the same lines, you can expect many applications that use Astoria as their data services and are built around AJAX or Silverlight to still have their own database. In those scenarios, the Astoria data services will be part of the Web application itself, and will be deployed together with the rest of the application components. This is one of the scenarios we target with Astoria, but it is not the only one we envision. Another way of looking at Astoria is as a technology for building data services for other systems to consume. Data providers can set up Astoria servers that other applications can interact with, both consuming and updating data as required and as allowed by the security policies. The provider of the data could be either the same as the owner of the application that consumes the data or it can be a service for others to consume. Yet another way of looking at Astoria is as a general-purpose service for data storage. To explore this idea we have set up an experimental online service that hosts several sample data sets, including the Northwind and AdventureWorks sample databases, a subset of the Microsoft Encarta articles and a snapshot of data that supports the Microsoft TagSpace social bookmarking site. Turning this into a real-world service requires technology well beyond just the HTTP interface and patterns, and that is a space outside of the scope of the Astoria project, but we still find the experimental service valuable as a learning tool, to see what applications developers would build on top of it. Exposing a Web-facing data interface requires careful thinking around securing access to make sure only the data that is meant to be accessible is effectively accessible over the HTTP interface. This involves both an authentication infrastructure and proper authorization policies. While a lot of the design points in Astoria equally apply to Astoria as a component of an application and to Astoria as a service, authentication is one of the areas where this is not the case. When using Astoria data services as part of a custom Web application, authentication typically applies to all resources within a given boundary, including access to data. Users would authenticate once with the Web site and the system needs to be able to apply the credentials to the data service as well as to the rest of the application. Astoria looks into the ASP.NET API to find out whether a user is authenticated and to find out further details, so that an application that uses any authentication scheme properly integrated with ASP.NET will automatically work with Astoria. Integration with ASP.NET authentication means that in typical cases common authentication-over-HTTP mechanisms will work. This includes “forms authentication”, integrated authentication (useful inside corporate networks), and custom authentication schemes; it is even straightforward to roll a custom implementation of HTTP “Basic” authentication, which may be good enough when used over SSL connections, depending on the nature of the application. For online services this becomes a much bigger challenge. Besides the actual technological question of how authentication happens, there are higher level differences that need to be addressed first: If an application and the data service are from different sources, is the data in the data service owned by the user of the application? If it is owned by the user, then the application should not have access to the user’s credentials to the data service. What is required in this scenario is a scheme where the user authenticates with the data service independent of the application (which may require authentication as well). We are exploring this space as part of the Astoria design effort, and although we have a reasonable understanding of the scenarios, we have not yet designed concrete technology to support them. Once the authentication scheme is in place, a proper authorization model is required. 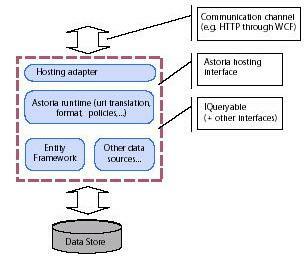 The currently released version of Astoria (May 2007 CTP) has an over-simplistic implementation, where authentication policies can be set at the resource container level ( /Customers, for example); on each one of them the configuration can indicate whether authentication is required to read the resources in the container, and to write to them. This is not flexible enough for most applications, so clearly a more sophisticated scheme needs to be provided. The manner in which applications are being written is changing. One of the key traits of emerging Web applications is the new ways they interact with their data. There is a clear opportunity here to introduce base technology to help the development community take on this new space. With Project Astoria, we aim at enabling the use of data as a first-class construct on the Web and across the application stack. We want to provide the infrastructure for creating Web data services, and also contribute to the creation of an ecosystem where service providers and service consumers use a uniform interface for data. We would like to see UI controls vendors, client library writers, and other players leverage the power for reuse of the data interfaces to build better tools for Web application creation. We are starting with this vision at home. Within Microsoft we are closely collaborating with various groups to explore different aspects where Astoria can play. On the services side, we are working together with the Windows Live organization, the Web3S folks in particular (they are responsible for the data interfaces for Live properties), to explore a world where every data interface is a Web3S/Astoria interface and can be consumed by the various tools and controls out there. On the tools side, the ASP.NET, WCF, and Astoria teams, as well as the various folks involved in Silverlight, are working together to provide a solid end-to-end story for Web application development, which includes first-class tools and libraries for interacting with data from Web applications and services. Project Astoria moves fast and focuses on solving real-world challenges around the Web and data. We plan to go through the design process in a transparent way, so everyone can see what we are up to. It is an exciting time to be working on this space; I would encourage anyone that has an interest in the topic to check out the Astoria Team blog, follow our design discussions, and jump in whenever you have an opinion. Pablo Castro is a technical lead in the SQL Server team. He has contributed extensively to several areas of SQL Server and the .NET Framework including SQL-CLR integration, type-system extensibility, the TDS client-server protocol, and the ADO.NET API. Pablo is currently involved with the development of the ADO.NET Entity Framework and also leads the Astoria project, looking at how to bring data and Web technologies together. Before joining Microsoft, Pablo worked in various companies on a broad set of topics that range from distributed inference systems for credit scoring/risk analysis to collaboration and groupware applications.